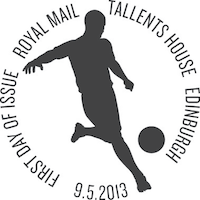 Royal Mail is issuing a set of stamps and a Miniature Sheet on 9 May 2013 to mark the 150th anniversary of the founding of The Football Association as well as 140 years of The Scottish Football Association. 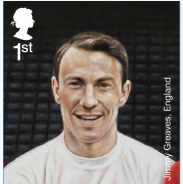 The stamps feature a ‘dream team’ of legendary footballers selected from around the United Kingdom namely Jimmy Greaves, John Charles, Gordon Banks, George Best, John Barnes, Kevin Keegan, Denis Law, Bobby Moore, Bryan Robson, Dave MacKay, and Bobby Charlton. Royal Mail worked very closely with the National Football Museum and with its experts, archivists and curators, to establish a listing of the key great footballers to celebrate. The football museum itself has established a Hall of Fame and the players selected were from those who were inducted into the Hall of Fame when it began. Royal Mail also looked at the history of UK football, but applied criteria to select players whose key senior career was within the years 1963-1990s, who will be much more familiar to present day footballers than those of earlier eras, and include many players who have a cult following and widespread agreement of genius on the pitch, such as George Best. 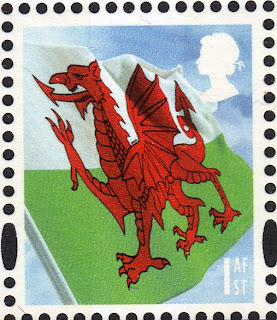 The stamps are 30 x 32mm and the miniature sheet is 192 x 74 mm. 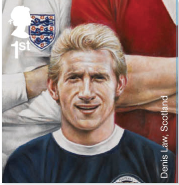 There will also be a prestige stamp book (details to follow) and a series of retail stamp books, the first of which contains 4 x 1st class red Machin definitives and the football stamps showing George Best and Bobby Moore. 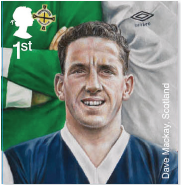 A second retail booklet will be issued later in the year* with the John Charles and Dave Mackay stamps. * The issue date will be subject to operational need and may be in 2014. John E has reminded me that I haven't posted details of the cylinder numbers on this booklet, so here is the image of a cylinder booklet. All W1, the 'colours' are dark red, phosphor, iridescent, magenta, cyan, yellow, black - although the iridescent and phosphor are difficult to distinguish. 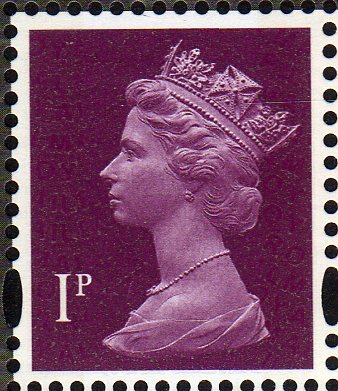 Colour mis-registration on this issue is less obviously wrong, but the alignment of the phosphor patches on the cylinder is most irregular. 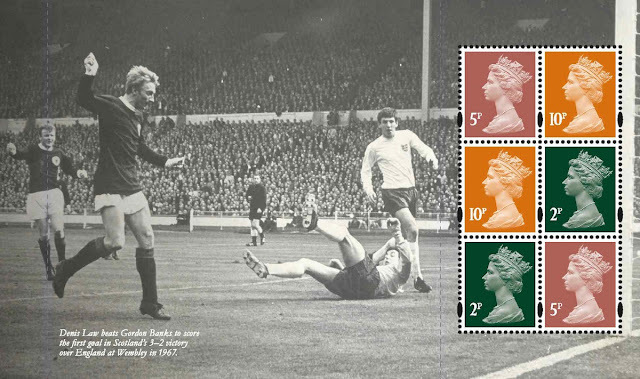 We have many booklets with the phosphor on the Bobby Moore stamp only dropped by up to 2mm. 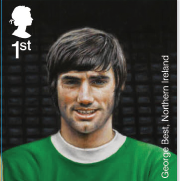 Other booklets have a downward shift of the phosphor on all 6 stamps, while some booklets have phosphor short on all except the George Best stamp! Oddly all the booklets with cylinder numbers have accurately placed phosphor. 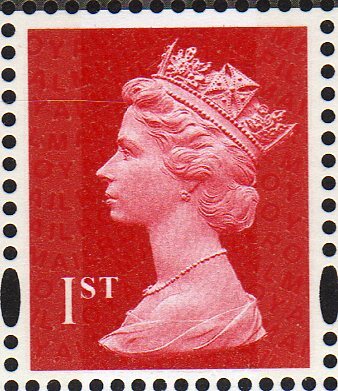 With two booklets this will also mean two six new Machin definitives, which have the M13L year code; one from the retail booklet with MCIL and five from the PSB with MPIL. 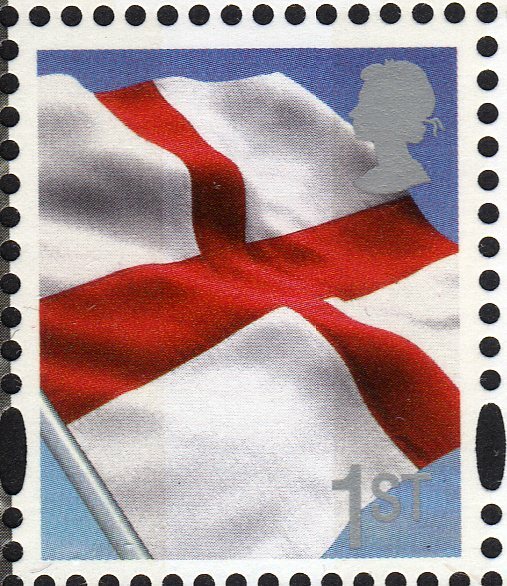 The country definitive stamps in the booklet do not have security overprints. 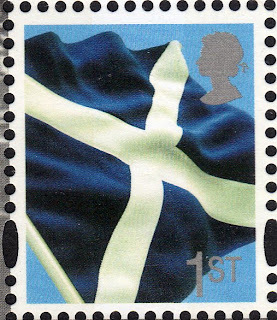 Incidentally this will be the first time that the three flag stamps have appeared in a way to get full catalogue status, previous versions being in the 'Celebrating' miniature sheets and Generic Smilers Sheets. We now have images of the PSB panes. The more I look at it, the more I think this issue is a good idea gone bad. The two definitive panes have been badly designed, as to their contents and layout. Pane 1 should have had the national stamps in the corners, or at N,S,E & W. Pane 4 has values so low (total 34p) that they should require extra stamps for a FDC! (We are awaiting a decision from Royal Mail on this.) Royal Mail have confirmed that additinal stamps to the value of 16p must be added to FDCs bearing this 34p pane. 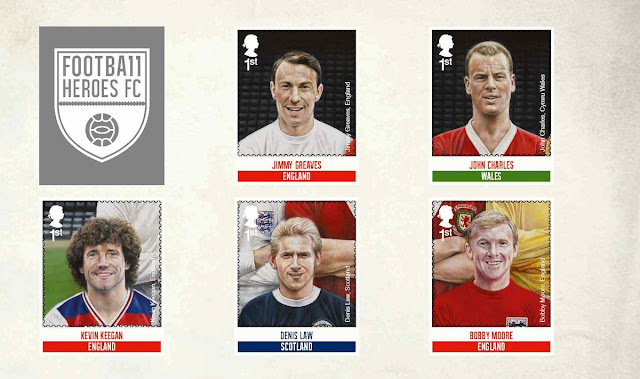 We now have the actual PSB panes, and I am disappointed to say that the two Football Heroes stamp panes are self-adhesive. 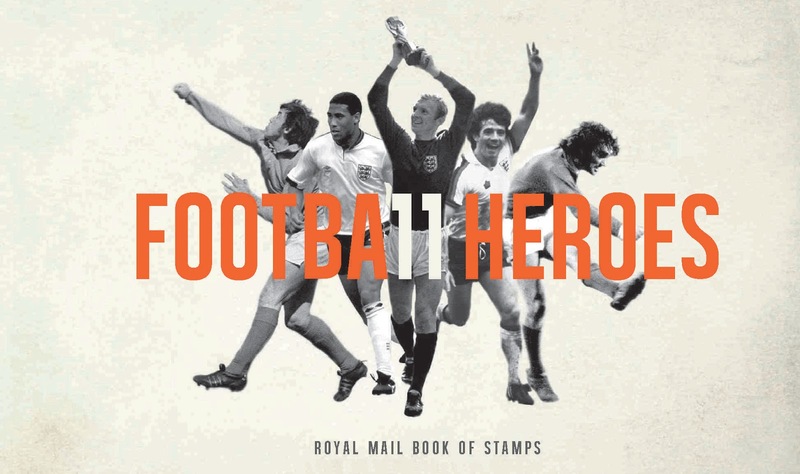 Disappointed (a) because no data on this was provided by Royal Mail in the pre-release publicity, and (b) because this means that collectors will feel they have to buy twice as many of the footballer stamps as they thought they would! The definitive panes are gummed, with security codes M13L MPIL on all the Machins and no security printing on the country definitives. According to the credits in the book, the booklet is printed by Cartor Security Print. But a second paragraph states that the definitive panes are in gravure by Walsall, which they are not. 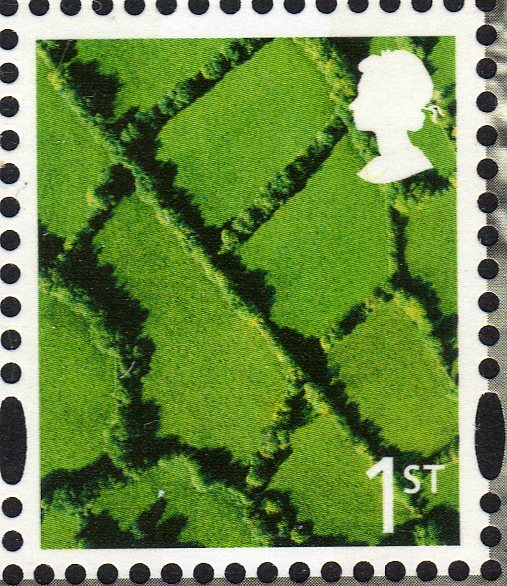 Special postmarks for this issue are shown on our website. A pretty decent set of 11 stamps, if a little biased towards English players. 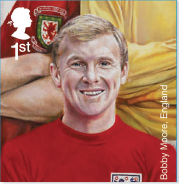 But did we really need yet another Bobby Moore stamp after he has been featured in two separate issues (the 1996 Legendary Players set & 1999 Entertainer's Tale)? How could you leave out the captain of England's World Cup winning side? And you forgot the team photo on the House of Windsor Timeline MS - you might be able to see a fraction of him there! Can you please let us know which printer has been used for the 2 machin prestige panes? Are these PVA or self adhesive? That information hasn't yet been provided. I think all panes will be with ordinary gum (making the country flag stamps the first available singly in this form and warranting full catalogue status). Whatever we are told now about the printers I would take with a pinch of salt until we get the books. The information IN the Dr Who PSBs is wrong, so we cant be sure of anything these days. We now have the PSB panes and have added details to the main blog. 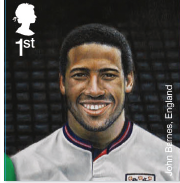 The Footballer panes are self-adhesive, creating at least 9 more stamps (Moore and Best are in the retail booklet already), 11 if you count different printers. The definitive panes are gummed, the layout is as shown above, with only 34p on pane 4. Royal Mail have confirmed that an additional 16p (or more) of stamps must be added to FDCs carrying only pane 4. 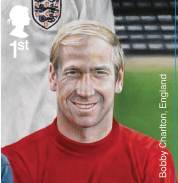 Yes, Bobby Moore is there too but you can really only see Jackie Charlton clearly on that stamp. Why no Smilers/Generic Sheet? 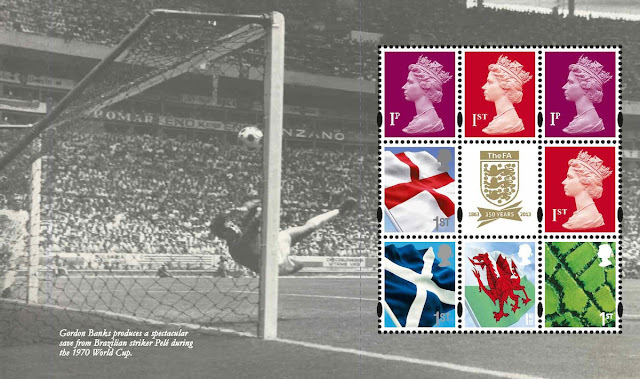 Are Royal Mail Trying to cut down on the cost of commemorative issues? Of course, we've had the Doctor Who extravaganza which emptied the coffers, not even RM can be that greedy, surely? They maybe 'holding back' as we don't what a Ist Class stamp will cost by May!!?? 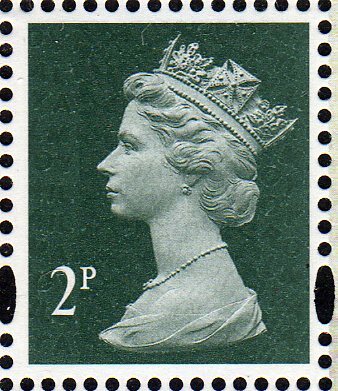 I think it would be much more appreciated and liked by the collectors if this set of 11 first class stamps was a mixture of first and second class stamps instead. For the sake of 10p I don't think it matters. And what would be the reaction if all the English players were 1st class and the rest 2nd class - it was never going to happen. 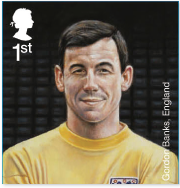 They just do not work when viewed as singles, except George Best and Gordon Banks. 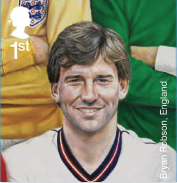 Bits of jerseys and/or folded arms alongside or behind the footballer make for cluttered or not-thought-through designs for the other nine stamps. At least the back row has a neutral background comprising just the empty seats. Is there are any text on the mini sheet margins? 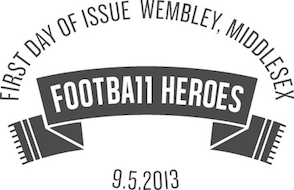 It appears not, so no reason for issue, or even that they are footballers. Lack of attention to detail has spoilt them for me. I've got them, but I've asked RM for clarification on the Machin/country definitive pane. As it stands, the stamp layout is nonsense. We are also awaiting news on whether the low-value pane will be serviced on FDCs 'as-is' with no other stamps, given its total face value of 34p. I think you've answered your own question. Even the players who are still alive are no longer playing; they come from a previous era. Personally those Football Legends stamps are rather crap, they look very comic to me, I'd rather prefer them photographic with football action. And I would have prefered 10 stamps not 11 as there is 11 players in a football team, I really don't know how 11 stamps going to look in my stamp album, let alone if they fit across the page. There have been previous stamp issues with a row of 6 stamps (A-Z if memory serves correctly). 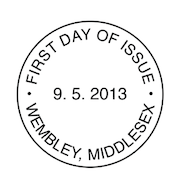 These will be issued with one sheet having 6 stamps x a number of rows, and the other having 5 x a number of rows. (They will probably both be in sheets of 30 stamps). This will be a real headache for the smaller Post Offices - I can imagine people going into my local Welsh PO and asking for the John Charles stamp. 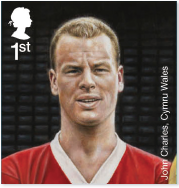 The John Charles stamps will be in a vertical column on the sheet. 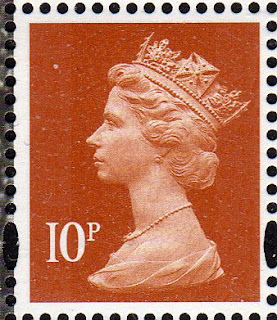 It would not be impossible for the POs to be supplied with additional copies of just that stamp. There is a sort of precedent when the Philatelic Service provided one of the Britons stamps last year to an organisation who couldn't get any more at their PO. But POs are normally supplied with whole sheets from Swindon. 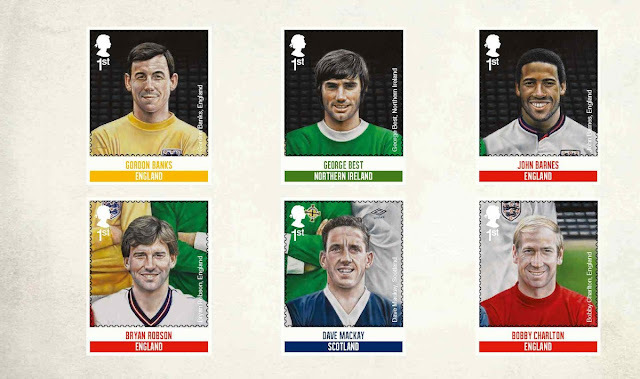 The Prestige Stamp Book will be supplied in a sealed foil wrapper, rather like those packs of football stickers we all collected avidly in the days of our youth. This creates something of a dilemma for the dedicated philatelist - whether to keep the booklet in sealed mint condition or open the package in the hope of discovering an error or two. The price set at £11.11 (as already mentioned) is a rather clever twist by Royal Mail. Yes the dilemma of opening the foil bag? In my opinion a complete and very unnecessary gimmick! In order to display my booklet I plan to be removing/discarding the foil wrapper. Does that mean it is no longer in 'mint' condition? 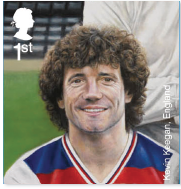 Hi there, am I the only subscriber to have received three copies (didn't ask for/order any extra) of the standard Footballers FDC? A total of 5 FDCs, instead of 3. There will be an intiguing phone call with the Subscriptions Department at Tallents House next week, as I do not intend paying for the surplus copies. Fingers crossed, it won't be expected of me. Does this kind of processing error occur from time to time?